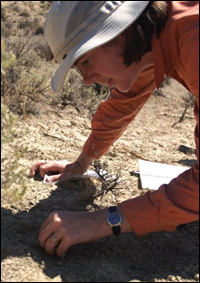 Samantha Hopkins is an Associate Professor in the Department of Earth Sciences and the Clark Honors College. She earned her PhD in Integrative Biology at the University of California, Berkeley, and joined the UO faculty after a one-year postdoctoral position at the National Evolutionary Synthesis Center in North Carolina. She is interested in examining paleoecology in the Oligo-Miocene of Oregon through the lens of rodent biostratigraphy. She teaches several Honors College and Geology courses; see a list and her teaching philosophy here. 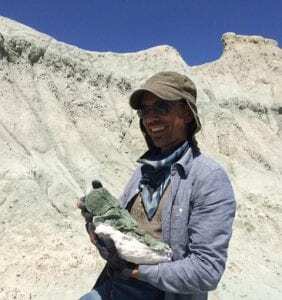 Edward Byrd Davis is an Assistant Professor in the Department of Earth Sciences and the Paleontological Collections Manager for the Museum of Natural and Cultural History. He received his Ph.D. in Integrative Biology from the University of California, Berkeley. He divides his time between museum curational nightmares, teaching in the UO Geology Department, and paleomammalogy research. Topics of particular interest include the evolution and development of headgear in ruminant artiodactyls, changes in macroecology over time, and conservation paleobiology. Click here to learn about his teaching. Read his blog here. Dana Reuter is a PhD candidate working with Dr. Hopkins. Her interest in geology has lead her to work on numerous projects. 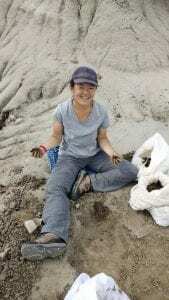 She has worked as a research assistant on glacial lake sediment flow in Svalbard, Norway, as a sample collector in the Grenville orogeny in Canada, and as an REU student studying carnivoran milk tooth morphology at the Chicago Field Museum of Natural History. Her research on mammalian paleoecology focuses on paleo food web building, carnivoran tooth morphology, and the evolution of omnivory. When she is not nerding out over geology and ancient mammals she is getting lost in the woods, brewing beer, playing board games, and reading philosophy books. You can view her personal website here. Paul Barrett is a PhD Candidate who is working with Dr. Hopkins on Feliform evolutionary history and constraint. Paul has a BS in Geology with a minor in Zoology, and an MS in Paleontology. Paul’s past research has focused on the taxonomy and phylogeny of the Nimravidae, as well as the dental morphology of sabertooth carnivores. In between his degrees, Paul has taught English in public and private schools in both Thailand and Japan while additionally being employed as an assistant curator for the Idaho Museum of Natural History and field paleontologist for Wind Cave National Park. When not getting lost in phylogenies, Paul enjoys camping, reading, ice hockey, and a delicious cup of coffee. Kellum Tate-Jones is a second year PhD student studying with Dr. Edward Davis. In her previous life, she was a registered nurse in Little Rock, Arkansas, but went back to school for a degree in geology after learning that rocks and bones are the best things in the world. During her graduate work, she will be focusing on the evolutionary history of pinnipeds—seals, sea lions, walruses, and their extinct relatives, particularly desmatophocids. Holley Flora received her B.S. in Earth Sciences from Montana State University. 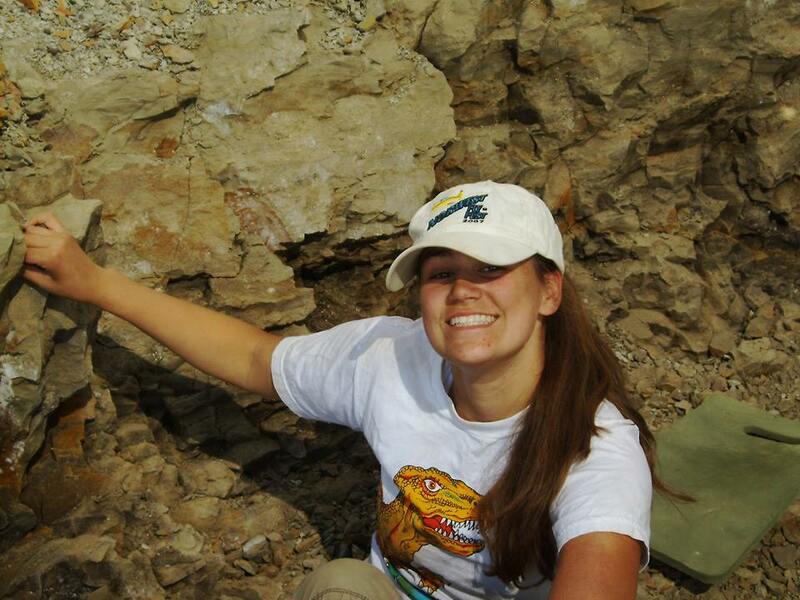 Her undergraduate research focused on paleohistology, phylogenetics, and science outreach for dinosaur paleontology. She’s excited to be working with Dr. Edward Davis towards a Master’s and getting to research fossil mammals, specifically antilocaprids and their headgear. Holley likes dogs, cookies, dancing, and the outdoors. Leonard Finkelman is a Masters student researching dynamics of the end-Pleistocene extinction. He has previously earned a Master of Philosophy degree in Philosophy and a Ph.D. in Philosophy from The Graduate Center at the City University of New York, where he wrote about species concepts in macroevolutionary theory. In addition to his research in the lab, Leonard teaches philosophy of paleontology as Assistant Professor of Philosophy at Linfield College, where he hopes to establish a Natural History program. Elena Ghezzo is a Research Fellow from the Department of Environmental Sciences, Informatics, and Statistics of Ca’ Foscari University in Venice (Italy), in collaboration with the University of Oregon and the Davis’ team. 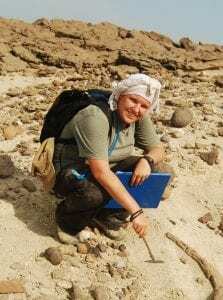 She has obtained a Global Marie Sklodowska Curie Individual Fellowship from the European Commission, for her research project regarding remote strategies for fossil finding (REFIND). She deals with high-resolution multispectral images and palaeontological databases in order to find new large palaeontological evidence exposed on desert surfaces, and to estimate the most parsimonious geographic range of extinct mammals in Europe. Her background includes anatomical studies of Pleistocene European mammals (lions, leopards, and large bovids). Moreover, she studied Oligocene anthracotheres discovered in northern Italy. She spends her free time reading and discovering new things. See her blog here. Helena de Bastos Cruz Machado is a first year PhD student who is working with Dr. Edward Davis on Pleistocene horses. She received her B.S. in Biological Sciences at the Federal University of the State of Rio de Janeiro (Brazil) and her M.S. in Geopaleontological Patrimony at the National Museum (Brazil). On her Master’s thesis, she made a taxonomic review of the genus Equus in South America and now she’s looking forward to research Pleistocene Equus and their relation with the Great American Biotic Interchange. Helena basically spends all of her spare time watching movies and series. Amanda Peng is excited to be working with Dr. Hopkins towards a PhD. She graduated in 2017 from the University of Washington with a double major in Biology and Earth Sciences. Her previous research has focused on the jaw biomechanics and feeding ecologies of Cretaceous mammals, and she also has an interest in the evolution of mammalian dental characters in non-mammalian synapsids. She has worked extensively in the Hell Creek Formation of Montana, which has helped her to develop a love of all fossils. In her spare time, she enjoys drinking coffee, hanging out with dogs, and playing tennis. Megan Wyatt is an undergraduate student in the honors college working with Samantha Hopkins on comparative morphology of miocene rodents. Dylan Carlini is an undergraduate student in the honors college working with Samantha Hopkins and Dana Reuter on mammalian body mass distributions for several Oregon fossil sites. Sierra Ching graduated in 2018 and was influential in streamlining the process for cataloging fossils and specimens. Win McLaughlin received her PhD in 2018 working on the biostratigraphy and landscape evolution of fossiliferous regions in Kyrgyzstan with Dr. Hopkins. Along with dead squirrels, she studies how organisms and their environments respond to climate change and other ecological perturbations. She received her MS from the UO in 2012. She was a 2015 Fulbright Scholar in Kyrgyzstan! View her blog. Adrienne Chainey graduated with her BS in Earth Sciences in 2017. Her senior thesis was titled “New Bovid Material of High Elevation Adapted Fauna out of the Kochkor Basin, Kyrgyzstan”. Genevieve Perdue received a MS in Earth Science in 2017 working with Dr. Hopkins. She completed her B.S. in Evolution, Ecology and Biodiversity at UC Davis in 2013, after transferring from Santa Rosa Junior College. Her thesis focused on the evolution of cranial modularity and integration in the Caviomoph lineage of Rodentia, which is the mammalian lineage that gave rise to horse-sized rodents! Her spare time is devoted to environmental activism, equine pursuits, taxidermic dabbles, and futile attempts to grow a decent heirloom tomato. 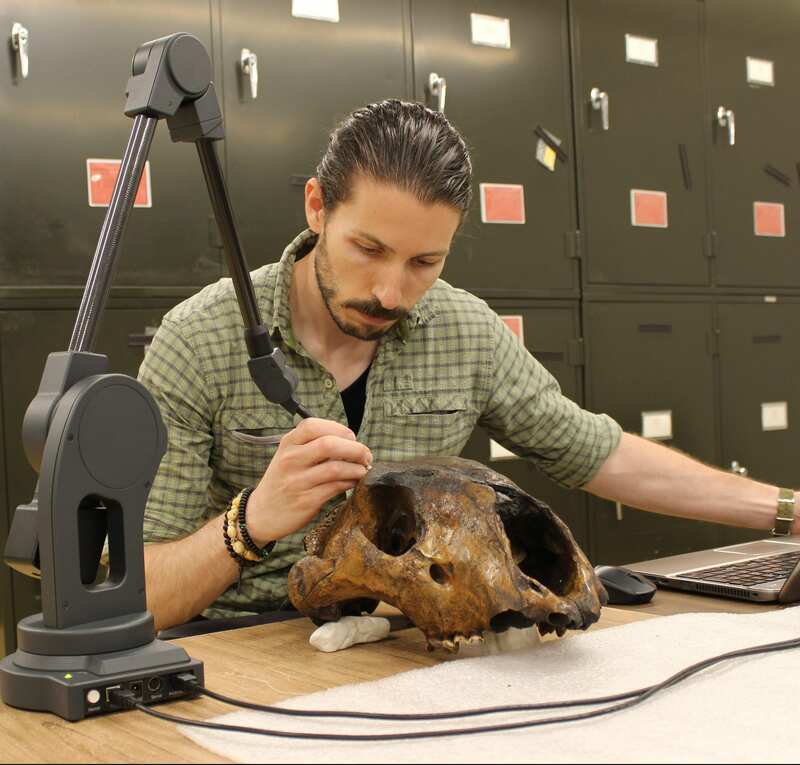 Nicholas A. Famoso received his PhD in Earth Sciences from UO in 2017 where he worked on understanding how mammalian communities respond to volcanic events in the Cenozoic with Dr. Davis. He received his MS in Geological Sciences from the UO in 2013. 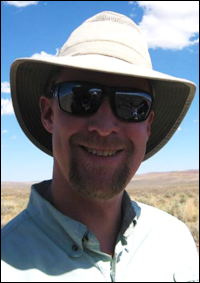 Nick is currently the Chief of Paleontology at John Day Fossil Beds National Monument. You can find his personal website here. 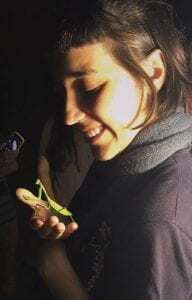 Meaghan Emery-Wetherell received her PhD in Geological Sciences from UO in 2016 where she studied diversity and variation in oreodonts with Dr. Davis. She is currently an adjunct lecturer and Associate Director of Research at Central Washington University. She co-writes a blog, Mary Anning’s Revenge, with lab alumna Amy Atwater and you can find her personal website here. Selina Robson graduated with her BS in Geological Sciences and Psychology with a minor in Biology in 2016. 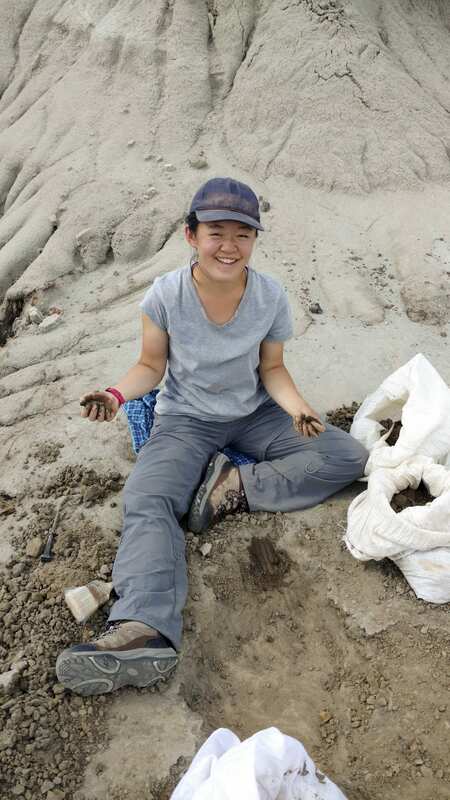 She worked with Win and Dr. Hopkins on fossil mammals from Kyrgyzstan and her senior thesis focused on the new species of hyena from the area. She is currently a masters student at the University of Calgary. Eva Biedron graduated with her BS in Geological Sciences and Biology from the UO Clark Honors College in 2016 working with Dr. Hopkins. Her thesis explored the fossil squirrels from a late Hemingfordian/early Barstovian locality in central Oregon. She is currently a masters student at Vanderbilt University. Kendra Walters graduated with her BS in Geological Sciences and Biology in 2016 working with Dr. Davis. Her thesis investigated the drivers of mammalian species diversity in the USA over the last century. She is currently a PhD student at UC Irvine. Danielle Oberg graduated with her BS in Geological Sciences in 2015. She worked with Dr. Hopkins on fossil insectivores from central Oregon. She is currently a masters students at East Tennessee State University. John Jacisin III graduated with his MS in Geological Sciences from the University of Oregon in 2014, where he studied Oligocene fossil newts from Oregon with Dr. Hopkins. He is currently a PhD student at Texas A&M University. View his webpage here. 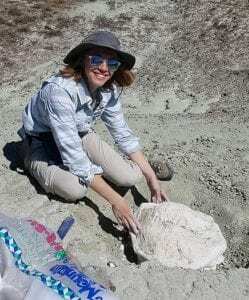 Kristen MacKenzie graduated with her MS in Geological Sciences from the University of Oregon in 2013, where she characterized the biology and geology of a new Oligocene-Miocene fauna in southern Oregon with Dr. Hopkins. 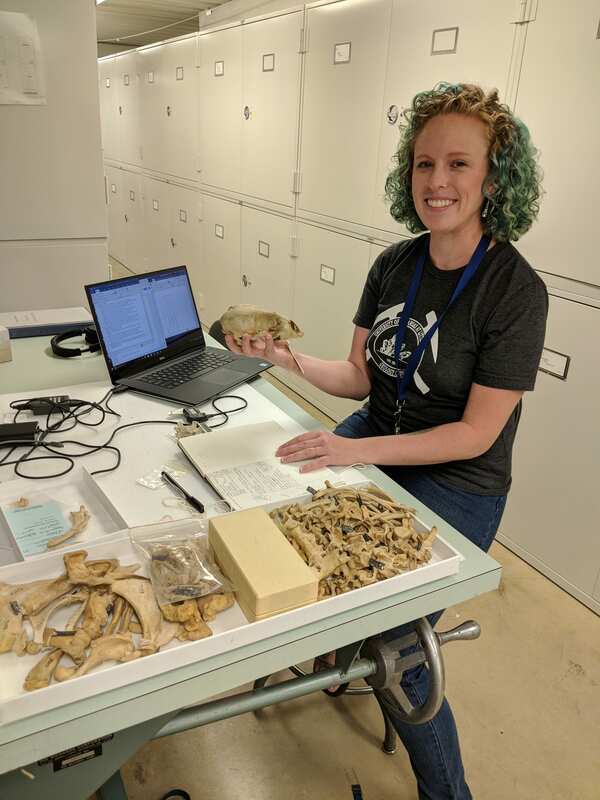 She worked as an assistant fossil collections manager at the Florida Museum of Natural History, and is now the Earth Science Collections Manager for the Denver Museum of Nature and Science. Savannah Olroyd graduated with her BS from the UO Biology department in 2013. She was an intern at the Field Museum in Chicago, where she studied the evolution and extinction of early mammals. She received her MS from the University of Washington in 2016 and is sticking around as a PhD student. Kelsey Stilson received her BS in Geology from the UO Clark Honors College in 2013. In her thesis, she explored patterns of arthritis in the rhinocerotid lineage over 60 million years. She received her MS at UT Austin in 2016 and is now a PhD student at the University of Chicago. She co-writes Fossilosophy, and you may view her website here. Brianna McHorse graduated from the UO Clark Honors College in 2013 with a Biology major and Geology minor. Her thesis investigated the relationship between conformation and performance in three-day-event horses. She is currently a PhD candidate at Harvard, and she co-writes Fossilosophy with Kelsey. View her website here. Amy Atwater is a 2013 graduate of the UO Clark Honors College with a Geology major and Anthropology minor. She studied drivers of omomyid diversity patterns in her thesis and received her masters from UT Austin. She is now the Paleontology Collections Manager – Registrar at Museum of the Rockies in Bozeman, Montana. She co-writes Mary Anning’s Revenge. John D. Orcutt earned his MS in Palaeobiology at the University of Bristol and his Ph.D. in Geological Sciences from the UO in 2011 with Dr. Hopkins. He was a postdoc at Cornell College (in Iowa), where he taught undergraduate biology and focused his research on Pleistocene biogeography. He now holds a lectureship position at Gonzaga University where he is teaching ecology and evolution. You can find his vertebrate paleontology blog here. You may visit his webpage here. Jonathan Calede graduated with an MS in Geological Sciences in 2010 with Dr. Hopkins and his PhD from the University of Washington in 2016. He is currently a visiting assistant professor at Bucknell University. Here is his current webpage. Winifred Kehl graduated with her bachelor’s degree from UO in 2010. She is interested in scientific art and did a research project on a late Miocene mustelid. She went on to get her MA in Museology from the University of Washington in 2012. View her website here. Christie Lowell completed her senior honors thesis, “Rates of evolution and diet activity patterns of mammals,” in 2010. 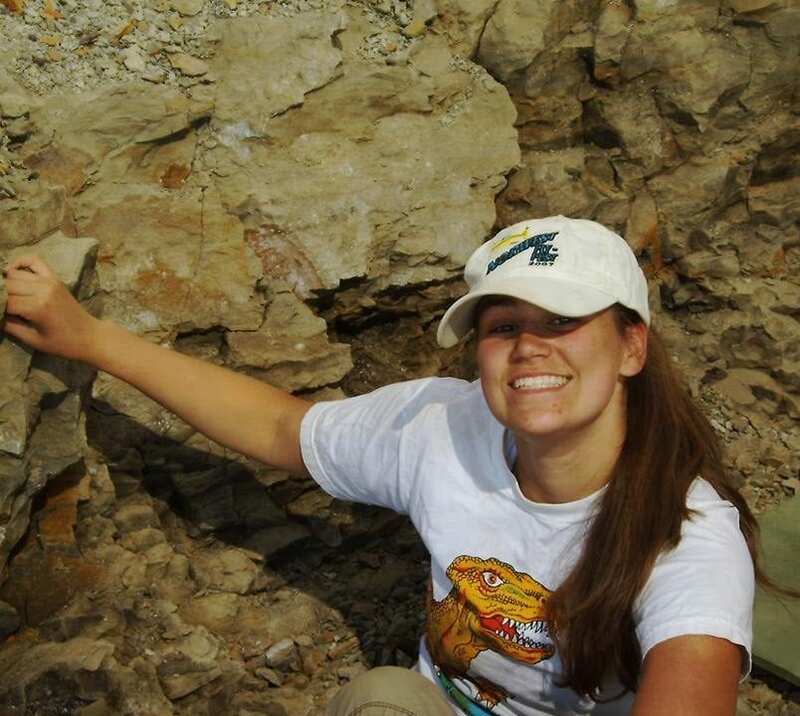 Aili Gusey graduated with her BS in Geological Sciences in 2010, she worked with Dr. Davis on a project investigating diversity biases of the published record of fossils. She worked for the US Forest Service in Oregon and is now working for the US Bureau of Land Management in Nevada. David Levering graduated from the UO in 2006 with a BS in Geological Sciences. He studied Multituberculate disparity and KPg extinction ecology for his masters thesis at Oklahoma State University. He is currently Director of the Sternberg Science Camps at the Sternberg Museum of Natural History in Kansas. You can explore the camps program here. His ongoing research is focused on mammal locomotor ecology. Theodore Fremd is a Courtesy Research Assistant and Curator with the Museum of Natural and Cultural History and the UO Department of Earth Sciences. He was the Chief Paleontologist at the John Day Fossil Beds National Monument for 25 years, and his research focuses on the biostratigraphy and evolution of Paleogene and Neogene biota of the John Day Basin. Current projects include describing canids, nimravids, and the a Stibarus-like leptochoerid, as well as writing two new books. David Whistler is a retired Curator from the Natural History Museum of Los Angeles County, a mammalian biostratigrapher with an inordinate fondness for rodents. He is a Courtesy Research Associate with the UO Department of Earth Sciences. Joshua Samuels is an Assistant Professor at East Tennessee State University and a Courtesy Research Associate with the UO Department of Earth Sciences. He was the Chief Paleontologist at John Day Fossil Beds National Monument from 2010-2016. He is also interested in rodents, particularly beavers. Jessica Theodor is an Associate Professor at the University of Calgary. She uses the fossil record of mammals, especially hoofed mammals (ungulates), to study long-term patterns of biodiversity through time. She was our Meierjurgen Visiting Faculty Fellow in Spring 2015. You can visit her lab page’s here. Kelsey Stilson: Integrative Biology and the furby?